Store these in the fridge as the coconut oil-based topping melts easily, especially in the balmy December weather! These squares also make for great edible gifts. Line a 20cm square baking tin with cling film (wipe the dish with a damp cloth to help the cling film stick). Set aside. For the nut “shortbread”, place the 4 pitted medjool dates along with the remaining “shortbread” ingredients in a blender. Blitz until well combined and the nuts are finely chopped. Spoon the mixture into the prepared baking tin and press into the base. Use the back of a spoon to smooth the surface. Refrigerate until needed. For the tahini “caramel”, place the 7 pitted medjool dates along with the remaining “caramel” ingredients in a blender (it isn’t necessary to wash out your blender if you have thoroughly scraped out the “shortbread” mixture from the previous step). Blitz until smooth and then pour the mixture over the chilled “shortbread” base. Use the back of a spoon to smooth the surface. Refrigerate until needed. For the “chocolate” topping, place all of the ingredients in a medium glass bowl and whisk until well combined and smooth. Pour the mixture over the chilled “caramel” layer (tip and rotate the baking tin to create an even layer). Refrigerate until set, about 2 hours. Carefully lift the slab out of the baking tin and place on a chopping board. Using a sharp knife dipped in hot water, cut the slab into 25 squares measuring 4cm each. 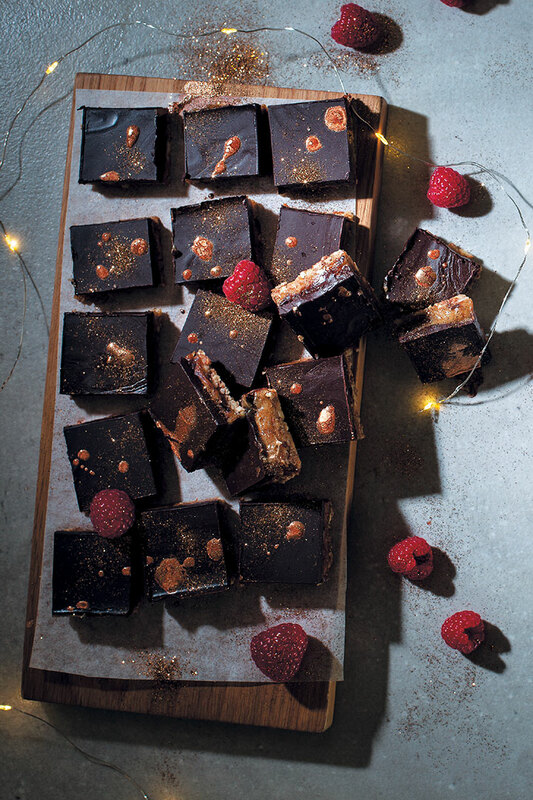 Transfer to a serving platter and dust the squares with the edible glitter. Decorate some of the squares with drops of the metallic drizzle. Serve with the raspberries, if desired. Store any leftover squares in an airtight container in the fridge for up to 5 days.